The other day we were talking about Efteling’s new addition of a zoetrope in Station de Oost. Our good friend Eftelwesley has shared this video of the zoetrope; take a look! Back to Efteling! About a week ago, a large mysterious box turned up in Station de Oost labelled ‘Luggage’, with a monkey peeking over the top of it. What was this puzzling box? Why was it there? Why were there Coca Cola signs on the exterior? Has Doctor Who part-exchanged his Tardis? ‘New in the Efteling: a zoetrope railway station in the east! That is probably a bad translation and there probably isn’t a railway station inside, but who knows?! Maybe monkeys and Coca Cola bottles are involved! I did hear that there are flashing lights inside, so presumably this is a 3D zoetrope. No doubt a video will turn up soon, so keep an eye on our Facebook page where it will probably be shared! I Don’t Speak Dutch, Will I Understand Everything at Efteling? I’ve been asked this question a few times recently, so I thought that it would be a great subject for a post! Can you really get the most out of Efteling if you don’t speak Dutch? Many of us English folk do not happen to speak Dutch, so it can be a little difficult at times to understand certain things on your visit to Efteling. There are two main language barrier issues that you’ll come across at Efteling, from my experience. The first is understanding some of the attractions, and the second is ordering food (although there seems to be more English menus available upon request than there used to be). As far as attractions are concerned, lets start with the Fairy Tale Forest (Sprookjesbos). Will you understand each tale by standing and listening to it? No. Most of the fairy tales you will be familiar with, such as Little Red Riding Hood and Rapunzel, but the ones you don’t know are impossible to understand if you know no Dutch. To help combat the language barrier, Efteling have provided decorative books next to each fairy tale, which tell the tale in 4 languages. Illustrated Efteling story books are also available at the gifts shops, making perfect reading for the nights you are staying at the park! The two pre-shows in Villa Volta are totally in Dutch, so here’s your chance to practice your acting skills and pretend like you’re listening and taking in every word! There are boards outside on the wall however, explaining the story in multiple languages, so use your waiting time wisely by reading them. When it comes to food, you want to know what you’re ordering, and as mentioned above, Efteling now has English menus available at most of their restaurants. 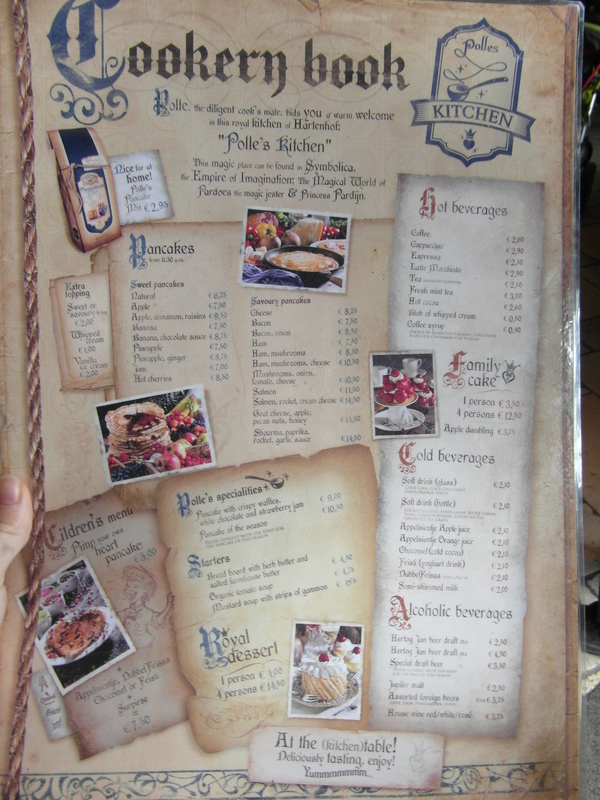 Click here for Polle’s Keuken menu (2012). The vast majority of the staff members also speak English (and other languages) and are always happy to help a confused foreigner! The park maps are multi-lingual, and the Efteling app and the website are now available totally in English too! If you want to get a better understanding of some of the stories and attractions at Efteling before your visit, then make sure to check out this site where my friend Milena has translated all of the stories and many of the attractions at Efteling. Although there is a lot of Dutch used in Efteling, many more attractions rely purely on visuals and music and the language barrier, when it does surface, certainly does not detract from this fabulous park! Efteling’s Best Commercial Yet, in English! It’s very dramatic, but in a fun way, and definitely acts as a teaser to anyone who has never been to Efteling before. Efteling are Looking for Your Memories! Next year, Efteling will be celebrating its 65th anniversary, even though it seems like no time at all since the 60th! For this occasion, they are asking guests to submit their memories of their trips to the park. Click here to submit your memory. Memories will be used in publications such as posters and, I believe, a 65th anniversary book commemorating this milestone. It is also very likely that the Efteling Museum will hold a 65th anniversary exhibition as they did during the 60th year.